Interview on NBC's Today Show with Shawn Simons, Alvaro Llanos, director of "After the Fire: A True Story of Heroes and Cowards," Guido Verweyen and author of "After the Fire: A True Story of Friendship amd Survival," Robin Gaby Fisher. Burn victims teach students about fire safety in Tippecanoe County, Indiana. Video courtesy of Jamie Long for WLFI.com18. Two Seton Hall University fire survivors spoke to seniors at Sayreville War Memorial High School about their harrowing ordeal and their struggles to heal. They also offered fire safety lessons. 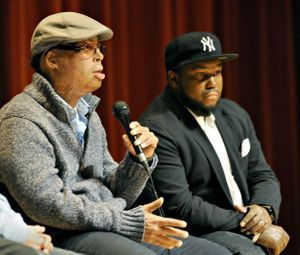 Photo by Daniel Freel/New Jersey Herald - Shawn Simons, left, and Alvaro Llanos, who were both victims of the 2000 Seton Hall University dorm fire, spoke to students and parents at Wallkill Valley Regional High School in Hardyston about their experiences. After the Fire showing a solemn reminder of the importance of fire safety at Georgetown University.